David Sancious has played with everyone from Bruce Springsteen to Santana, Seal and Bryan Ferry. 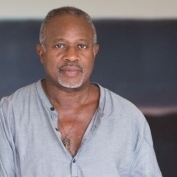 Nine weeks of world travel started Tuesday morning for keyboardist David Sancious, who won't return to his home in Woodstock, New York, until the second week of August. Not that the 59-year-old is complaining. "When we go out on tour with Sting, it's as nice as it could be," Sancious said Monday, prior to departing for Kelowna and the start of Sting's Back to Bass Tour. "We fly in a private plane, most of the time, and with [an instrument] technician at our beck and call. But as high as it has gotten for me, I don't lose touch with the basics of what it means to be a musician." Sting plays Victoria for the first time on Friday, one of six Canadian dates on the trek that began in 2011 as a celebration his 25th year as a solo artist. The singer-bassist has been immensely successful since leaving The Police, with 13 studio albums, 11 Grammy Awards and three Oscar nominations to his credit. He's also a popular draw on the concert circuit, in addition to being one of the most recognized environmental and social activists in music. But despite all this, Sancious said the Briton born Gordon Sumner remains the same man he met during Amnesty International's Human Rights Now! tour in 1988. "There's a playful spirit to the way Sting operates," Sancious said. "He doesn't like to over rehearse. He's very flexible, and he's not stuck in his ways. He has his ways of doing things, but he's not necessarily stuck there. That keeps you on your toes." Sancious knows he must be prepared if Sting calls for a song that is not on the setlist. Once, during a pre-concert soundcheck in Asia, Sting wanted to run through The Police hit Spirits in the Material World. The spur-of-the-moment suggestion was made easier by the long-standing relationships between group members, some of which date back 25 years. "Not only had we not played it recently, I don't think we had ever played it more than once," Sancious said. "But we pounced on that song and within 30 seconds, it was so tight. There's another language that develops that only comes with time spent together." He has played alongside plenty of musicians over the years, including Santana, Seal, Jeff Beck and Eric Clapton. Recording with Aretha Franklin was one of his big career highs, Sancious said. "She has a special place in my heart." For all his accomplishments as a solo artist, session player and touring musician, there are a few moments that stand out more than the rest, Sancious said. His membership in the early stages of Bruce Springsteen's E Street Band is a highlight, and his relationship with The Boss remains one of his most asked-about associations. Sancious (like Springsteen) is a native of Long Branch, New Jersey. When Sancious was 15, he met Springsteen and began a series of collaborations that ended when Sancious moved to Virginia to perform session work. He was back in New Jersey a year later to work with Springsteen, who Sancious sensed was becoming more than simply a cult commodity. "I knew at this point his energy was so focused and special that it was only a matter of time. I knew everybody was going to flip out over this guy. You couldn't be around him without knowing that this was somebody special." He toured with Springsteen and played on his two 1973 records, Greetings from Asbury Park, N.J. and The Wild, The Innocent, & The E Street Shuffle. Though he left to start his own group, Tone, in 1975, Sancious returned occasionally to the Springsteen fold, most notably to play keyboards on the 1975 single Born to Run. He linked up with Peter Gabriel in 1988, and continues to tour with him today. Sancious was on-board for the 25th anniversary tour for So, Gabriel's legendary 1986 recording, and is reuniting with Gabriel and his bandmates in September for an 18-date tour of Europe. Sancious said both Sting and Gabriel rely heavily on keyboards, a complex task that ultimately falls on Sancious's plate. "There's all of Peter's concert, which is 28 or 30 songs, and the same thing with Sting, another 25 or 28 songs you are expected to know," he said. "It's a lot of music I have to hold in my head." Grew up in Woodstock - great little town - I'll be looking for David next time i'm visiting!